I've known about this blog, but decided to post about it so you can check it out too... The Girl Who Ate Everything. You and I must follow the same blogs. I actually made this last week for a ward party and it is FANTABULOUS! 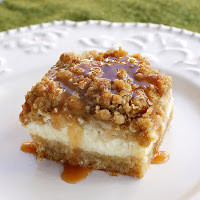 If you like cheesecake and apple cobbler, this is your dessert. I would love to try it out with cherries instead of apples, too. no... no heating... just mix it up dry like the crumb stuff that's on muffins sometimes. oh and Jerianne, I saw this off your blog silly... I follow you to find the good stuff!